The choice for people who know what they want. 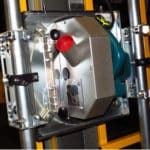 The Classic Series was developed as a lower price point panel saw for an apples-to-apples comparison with the bare bones panel saws that are on the market. They have identical accessories and price points. 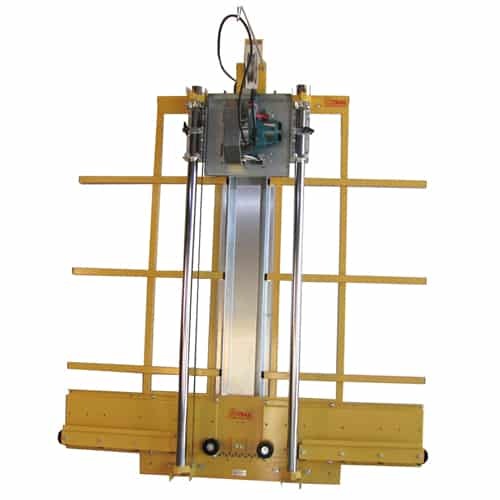 The differences are the standard features that come with each panel saw. 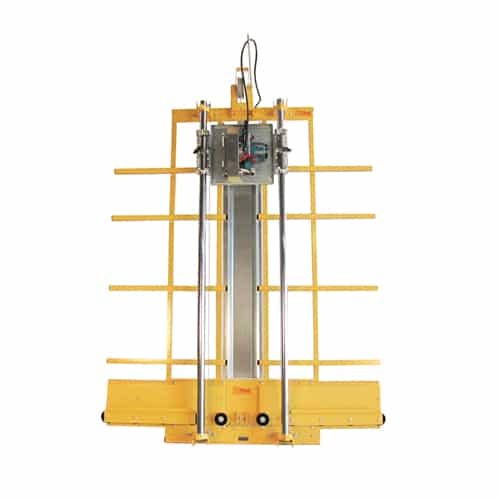 When these are compared, we feel there is "still no comparison" and your choice will be the Saw Trax Machine. Accessories can be purchased as needed instead of the bundled accessory packages we offer in other models. This is the choice of the user who wants what he wants and not what we think he should have. Models come in Compact frames with 52" and 64" cross cuts and Full Size frames with 52", 64" and 76" cross cuts. All models use the Makita 5007F saw. The Classic series was intended to directly compete with our competitors saw, offering the same accessories as their “plain Jane” saw. 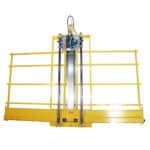 The Saw Trax difference are the standard features on each saw and they are BIG differences. Let’s discuss the differences that make our panel saw more precise and square. 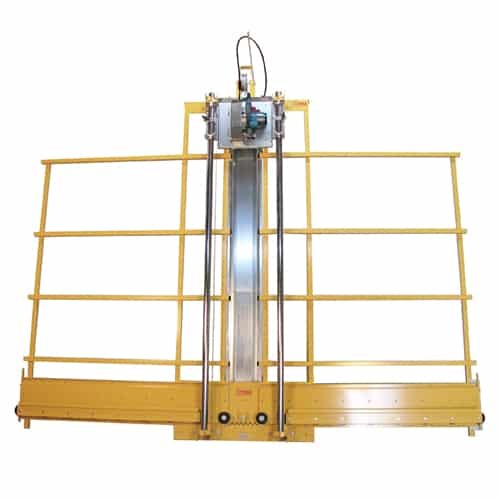 Those would be the Accu-Glide Bearing System, the Accu-Square alignment system and the Accu-Fence system. 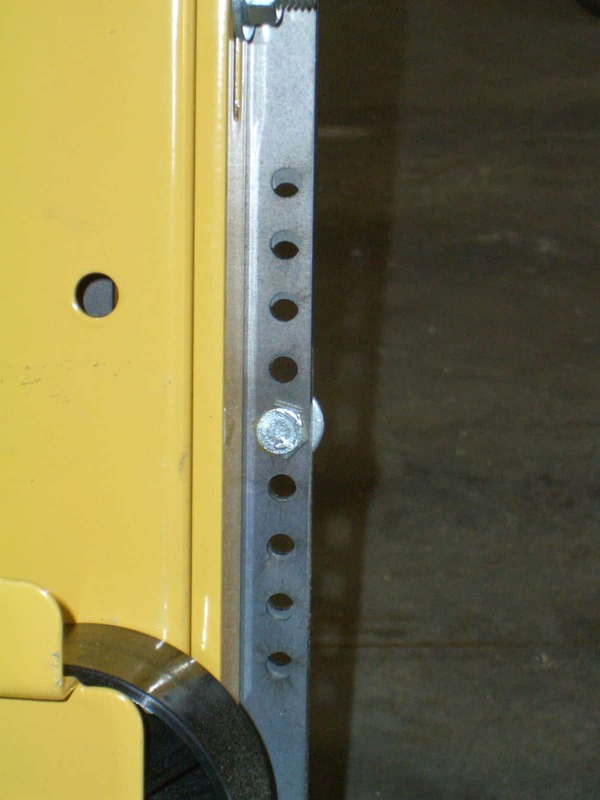 The Accu-Glide system uses 12 steel sealed bearings, 3 on each corner of the carriage. They are arranged 2 on top and 1 on the bottom to gently squeeze the steel guide tube ensuring a smooth and precise draw down of the saw. 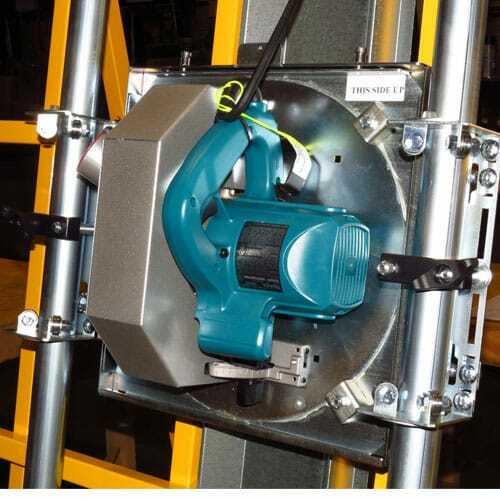 Other saws use a U-bolt with nylon washers as their bearing system. The problem with that system is the tighter you get them to take the play out of the carriage, the harder it is to move the carriage. 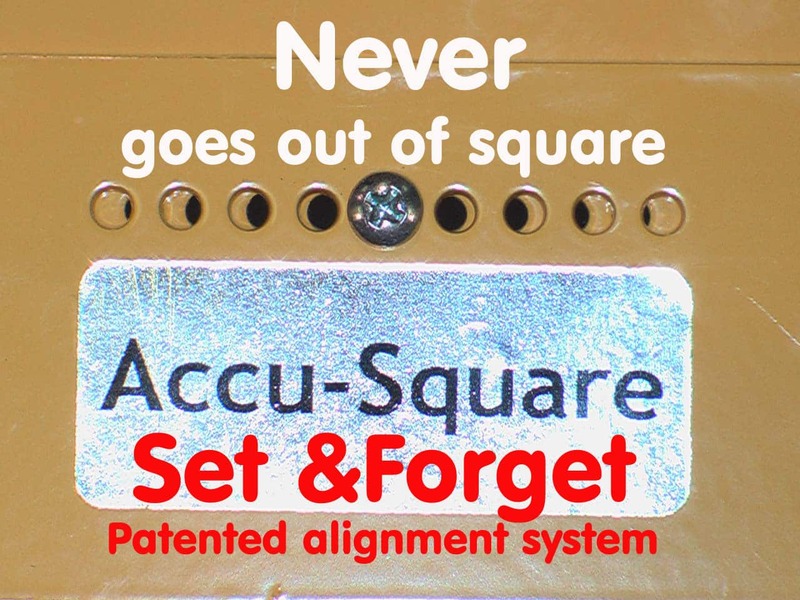 The Accu-Square indexed alignment system is our patented system to easily square the panel saw for a set and forget alignment. Below and between the center material rollers, you will see a series of 9 holes in the bracket holding the guide tubes. These holes are spaced 9/32″ apart with the 5th hole being centered. In the frame behind it are 9 holes, spaced 8/32″ apart with the 5th hole being centered. 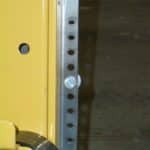 By shifting the bracket in relationship to the frame in 1/32″ increments, a different hole lines up with the hole in the frame. 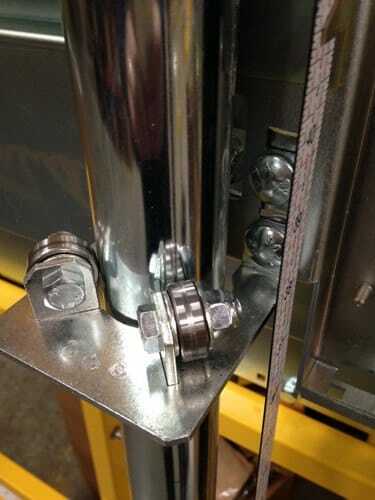 This way a sheet metal screw acts as an alignment pin locking the bracket to the frame once the machine is aligned. Sounds complicated but you don’t have to worry about it. 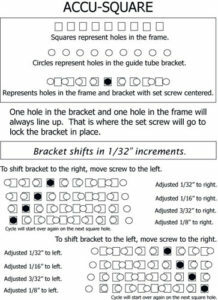 All that you need to know is the guide tubes will never shift on you getting your saw out of alignment so it will always cut square. The other guys have a 3 page alignment process that includes whacking your guide tubes with a dead blow mallet and repeatedly running the saw up and down to see if you whacked it the right amount or too much. (Not very precise). There is no way to lock the bracket in place once you whacked it right so keep that dead blow mallet handy. 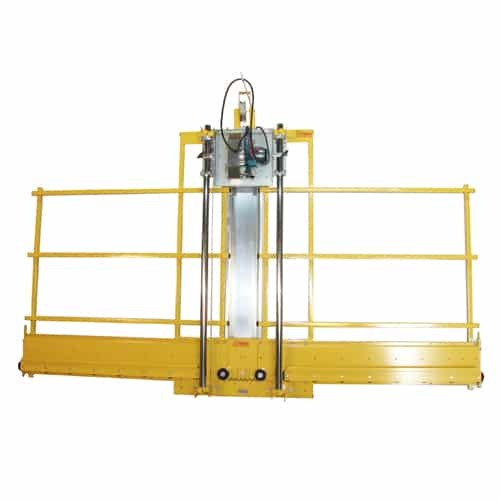 The Accu-Fence system is used on our full-size machines to ensure the rollers of the left fence line up with the rollers on the right fence. It uses a similar indexed alignment system to incrementally line up the outside of the right fence with the left fence. It is done at the factory and is set and forget so you don’t have to worry about it. The other guys weld their fences to the frame and have to make up for the alignment issues when the welds cool. To do this, they use the outside rollers as guides and all the interior rollers are on cams so they need to be adjusted up or down to correspond with the outside rollers. Not so simple; their instructions have you removing the stand, laying the machine on a table and using a 10 ft. straight edge on their 10 ft. wide models to align all of the rollers. The problem is no one makes a 10 ft. straight edge so you need to make one yourself. Once you have the wheels aligned, you will need to make a squaring tool also. That is why their Owner’s manual has a 3-page squaring process. Our Classic panel saw comes with the Makita 5007F saw and saw cover, mounted to a spinning insert plate in a quick release carriage. 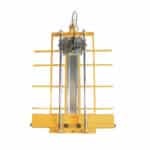 It uses the Accu-Glide steel sealed bearing system with 12 bearings to travel up and down the 11 gauge zinc plated guide tubes. 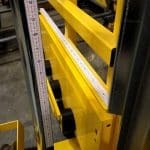 The guide tubes are attached to the frame with identical top and bottom brackets ensuring a straight travel of the saw. 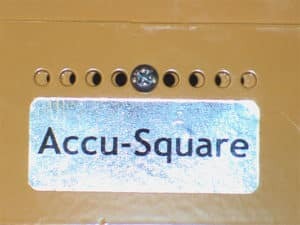 The top bracket is fixed to the machine and the bottom bracket can be moved with the Accu-Square indexed alignment system allowing for 1/32″ incremental movement. This is set at the factory for perfect alignment when you receive it. It will never go out of square with this system. We use 10 material rollers on our Compact 5 ft. wide frames vs. 8 on theirs and 18 material rollers on the Full Size 10 ft. wide frames vs. 14 on theirs. This difference provides better support on our machines. 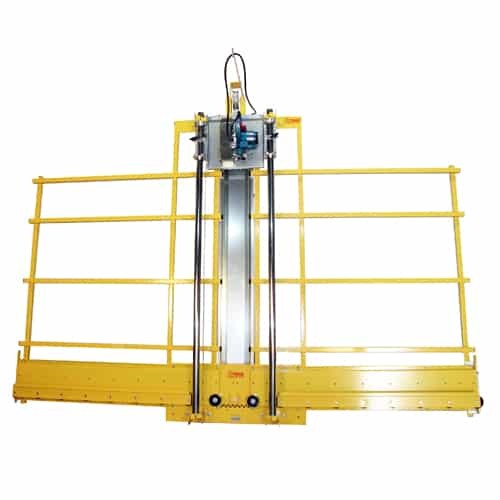 Besides more material roller support, a center material support step is used on our machine to support thinly cut pieces preventing them from falling and bouncing back into the saw blade after the cut. 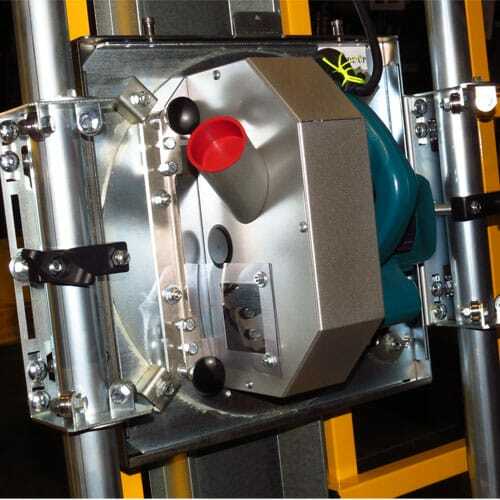 The Saw Trax machine is designed with the component system in mind. 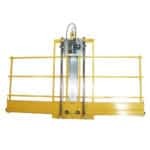 Where this makes a big difference is if your panel saw were to be damaged or you want to use a different cutting tool in the carriage. 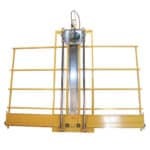 The guide tubes and material fences could be easily removed and replaced in necessary. These are the parts that typically get damaged. 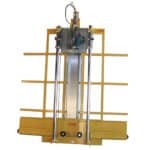 Since other saws weld these parts on, you are buying another machine. With ours, you simply get another fence or guide tube. Speaking of replacing parts, our Makita 5007F saw is an off the shelf saw. What this means it can be worked on by any Makita service centers or replaced by any Makita Dealer. This means to you cheaper and faster repair/replacement and shorter down times. 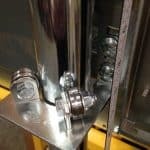 Both frames are welded steel tubing. Ours is powder coated not just zinc coated or painted. By the way, our panel saw comes with a 24 tooth Makita saw blade while they make you look for their 8″ obscure and expensive blade. The multi-function quick release saw carriage that can use other cutting tools like a floating router, razor knife, glass cutter, and rolling aluminum composite shear. This saw can be purchased with additional accessories or upgrade to our Varsity and 1000 series saws that have a bundled accessory package that is discounted but not required for cutting. 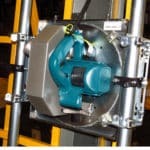 Including all the standard features, like a Makita 5007F circular saw on a spinning insert plate for both vertical and horizontal cuts and a dust containment hood and viewing port, our Classic Series Panel Saws are perfect for hobbyists. 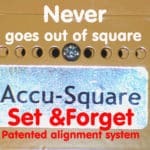 With Saw Trax Mfg., Inc.’s patented Accu-Square alignment system assuring that your machine will never go out of square, the Classic Series is reliable, accurate and easy to learn, and is the right tool for the person who wants what they want. What do you do if it arrives damaged??? No lock nuts on stand, Angle Iron.